Being a variant in culture and diversity north India has numerous appetizing foods. Even people who hate rice give in to the aromatic Briyani and the Awadhi Briyani is a famous food in the region. In times of uncontrollable hunger, Chole Bhature is a great lip-smacking dish to try out. 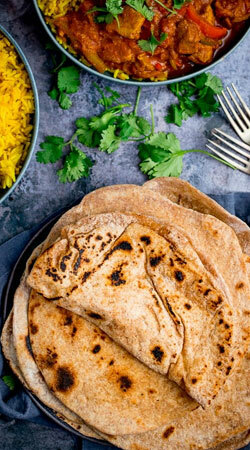 The traditional roti can be taken along with a dose of the creamy butter chicken or paneer butter gravy. During the chilly winters, the simple yet sizzling Baigan Bharta is the ideal choice. For the chicken lovers the special north Indian dishof Tandoori and chicken tikka masala is sure to satisfy that craving. Others include the traditional Parantha, Rajma Chawal, Dal Baati Churma and Dahi Vada.